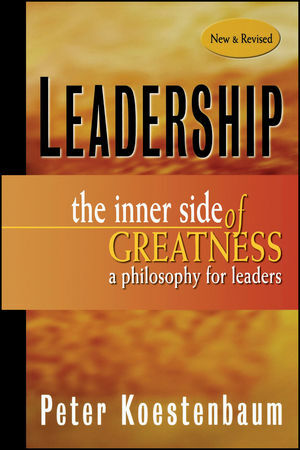 It has been more than a decade since the first edition of Peter Koestenbaum's landmark book Leadership: The Inner Side of Greatness was published. Since that time world events have caused a dramatic shift in how we think about our lives and our work. Now we grapple with the fundamental questions. How can we live a courageous life and manage anxiety? Is it possible to reach greater heights of ethics and responsibility? Peter Koestenbaum, the preeminent business philosopher, has been a trusted mentor to business leaders worldwide. In this thoroughly revised edition of his classic book he shares his wisdom about the fundamental nature of leadership and shows what it takes to become an exceptional and passionate leader in today's complex world. At the very heart of the book is his Leadership Diamond model—a paradigm that challenges managers to transform their thinking and approach everything with fresh effectiveness in order to reap richer results and become great leaders. Peter Koestenbaum is the founder and chairman of Philosophy-in-Business and the Koestenbaum Institute. He has consulted on leadership, management, marketing, and strategy implementation in nearly forty countries. He is the author of Freedom and Accountability at Work and The Philosophic Consultant, both from Jossey-Bass/Pfeiffer. Introduction—The Oath of Inner Greatness: Nine Keys to Business Wisdom. Part One—The Model: What Is Inner Greatness? 2 The Leadership Diamond: Four Strategies for Greatness. 3 Vision: Thinking Big and New. 4 Reality: Having No Illusions. 6 Courage: Acting with Sustained Initiative. Part Two—The Context: The Search for Greatness. 9 Implementing the Leadership Diamond. Part Three—The Real World: Leadership Strategies in Action. 12 Diamond Relevance to Current Crises. A Leadership Resource: Tips for Achieving and Sustaining Inner Greatness.